Three Californias: it’s one idea that appeals to both idiotic white trash and the technocrat fascists whom they worship. Us versus them, dude! Self-determination, dude! Local, brah! But it’s really about what it’s always really about: a legislated goldrush. In this case, that’d mean annihilating a tax base and maybe a commercial system that barely hold things together as they are. For you consumers who don’t pay attention to who and what make this state go, here are some realistic, yea, likely inevitable scenarios for a rich man’s three Californias after the November 2018 election. Vote yes, vote no, but vote your ethics! 1. Salinas, Pajaro, Santa Inez and Santa Maria valleys are to be bent to feed the Los Angeles Basin, while Sonoma is to feed the San Francisco Bay and the rest of the Northern state will likely be deforested to grow weed. A post for all “pro-business,” “pro-innovation” politicians who build skyscrapers and raise the liberal president’s stock market on the backs of thousands of local homeless citizens and victims of human trafficking and slavery. Get out the wheat paste, people! Stick this meme to REAL walls! 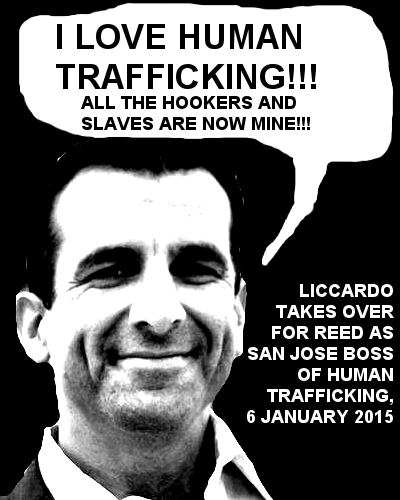 Never again can a mayor of San Jose enjoy the luxury of a tenure without retaliation from the people he vowed to oppress when taking the oath of office. And that goes for his homeboy Cortese, too.